1. Shape5: 40+ Joomla templates and extensions updated for Joomla 3.8.11 compatility, PHP 7 support and bug fixes. 2. DTHDevelopment: DT Register 4.0.1 and DT Donate 4.0 preview 2 updates for bug fixes and improvements. 1. 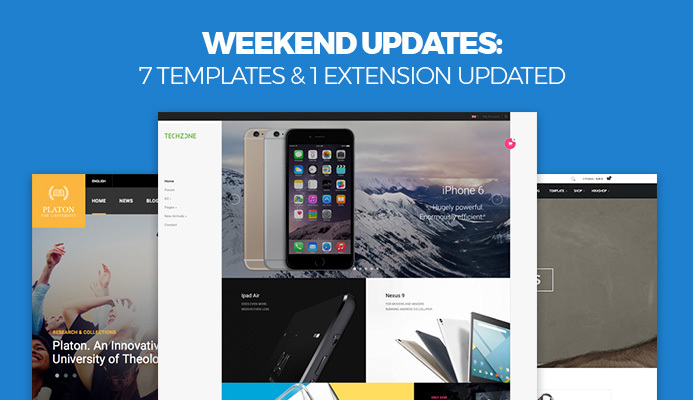 Shape5: Vertex framework, 10+ templates and 10+ extensions updated for Joomla 3.8.11 compatility and bug fixes. 2. 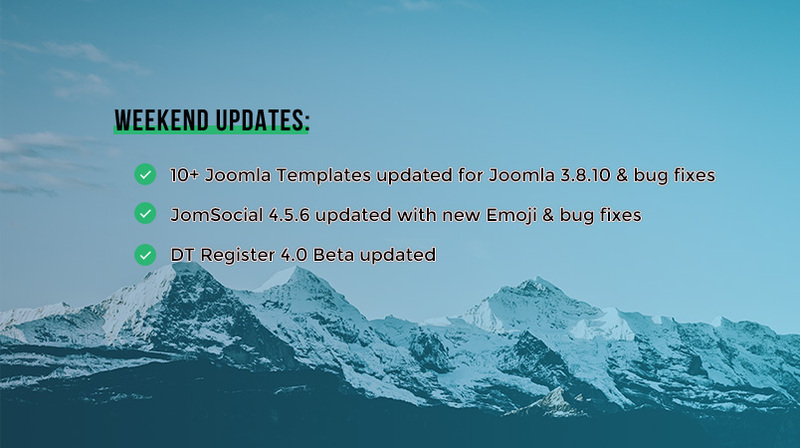 JomSocial: Jomsocial 4.5.8 updated for drag and drop upload, improvements and bug fixes. 3. DTHDevelopment: DT Register - Joomla Event Registration 4.0 stable version released and DT donate major. 4. iJoomla: Guru 5.1.10 updated for bug fixes. 2. 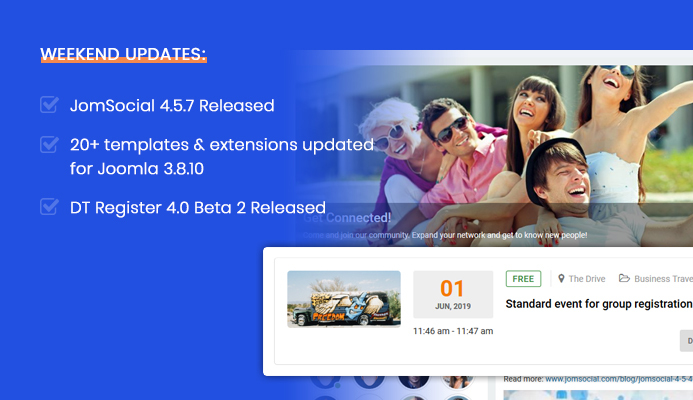 JomSocial: JomSocial 4.5.7 released for file sharing new feature, improvements and bug fixes. 3. DTH Developement: DT Register 4.0 Beta 2 Released with user profile function, invoice feature improvement and bug fixes. 4. JoomlaBamboo: 8 Joomla templates updated for Joomla 3.8.10 and bug fixes and 4 templates quickstart exported for Joomla 3.8.10. 1. 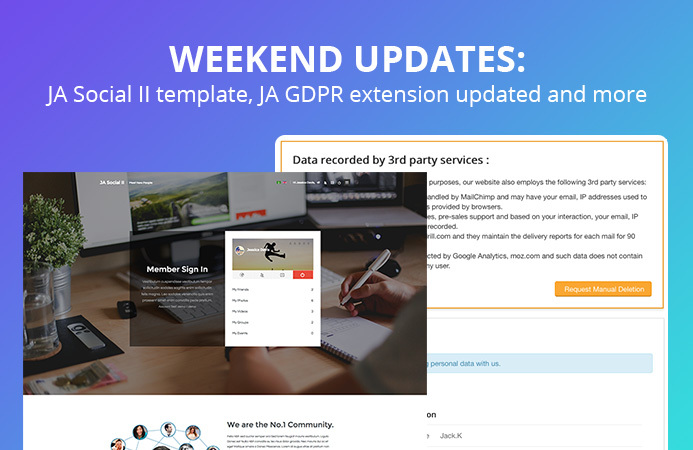 JoomlArt: JA Intranet templates updated for Joomla 3.8.10 and bug fixes. 3. DTH Developement: DT Register 4.0 Beta Released with invoice integration and 30+ bug fixes. 4. GavickPro: 12 Joomla templates updated for Joomla 3.8.10 and bug fixes. 5. JoomlaBamboo: JB New Lifestyle template updated for Joomla 3.8.10 and bug fixes. 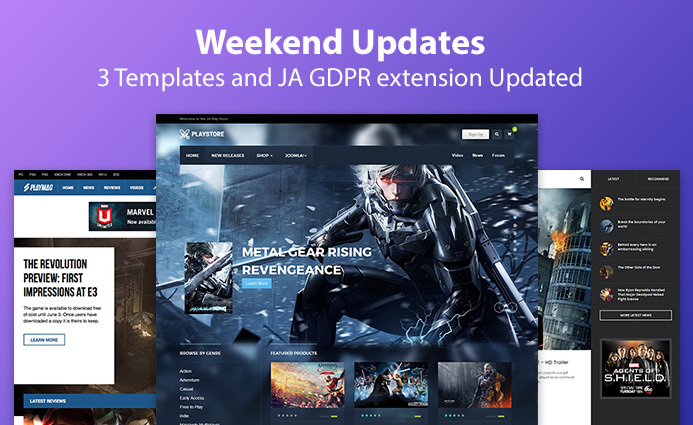 JA Purity III and JA Magz II templates updated for Joomla 3.8.10 and bug fixes. 3. DTH Developement: DT Register 4.0 Alpha released for bug fixes. 4. 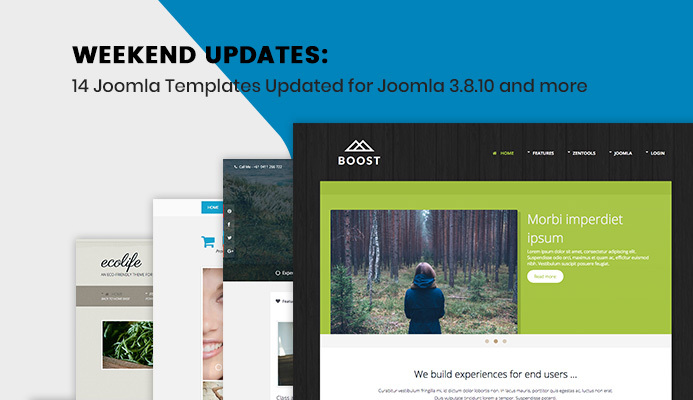 JoomlaBamboo: JB Highline template, Zentools and Zenshortcodes modules updated for Joomla 3.8.10 and bug fixes. 5. iJoomla: Guru and Ad Agency components updated for bug fixes. 6. GavickPro: 5 Joomla templates and GK Contact Joomla Plugin for Joomla 3.8.10 and bug fixes. 1. 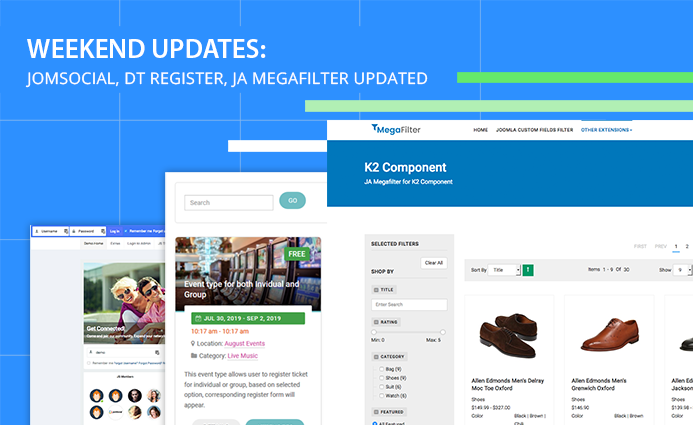 JoomlArt: JA Megafilter Extension updated for new feature Currency conversion, support filters for J2Store component and bug fixes. 2. JomSocial: New feature of renaming chat group, performance and other improvements plus 10+ bug fixes. 3. DTH Developement: DT Register preview 3 version released with 2 new themes and bug fixes. 4. JoomlaBamboo: JB Lifestyle2 updated for bug fixes. 5. iJoomla: Guru & Ad Agency updated for improvements and bug fixes. 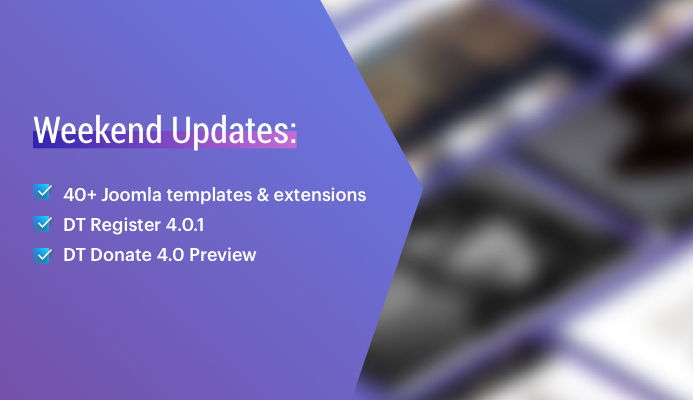 JA Joomla Page Builder updated for bug fixes. JA Social feed extension updated for Facebook Multi share post and Secure url import option. 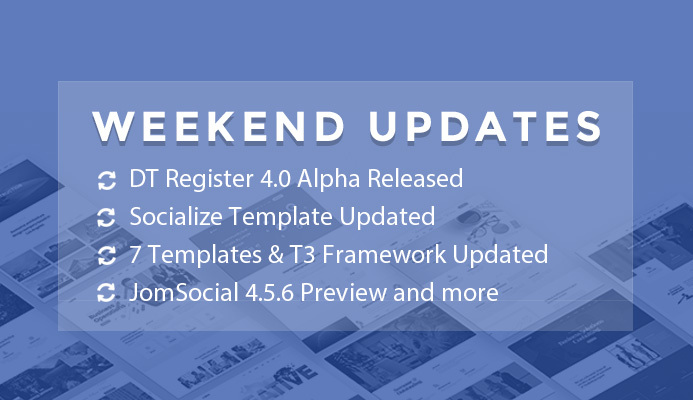 JA Nex T3 template updated for JomSocial 4.5.4 and Kunena 5.1.1 support. 2. 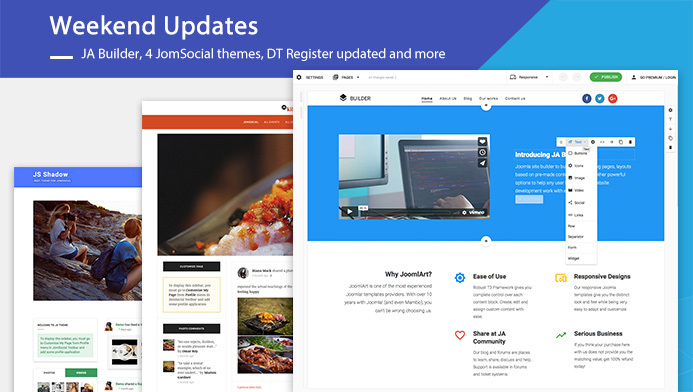 JomSocial: 4 JomSocial themes updated for bug fixes. 3. iJoomla: Guru updated for Improvmnents in Quiz. 3. 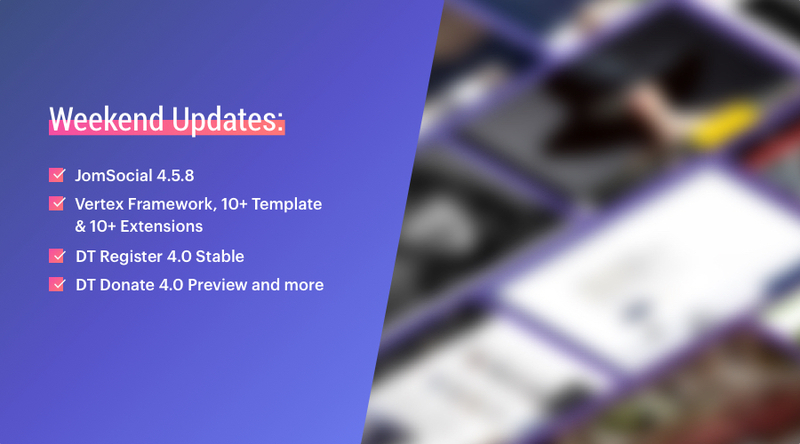 GavickPro: GK Storefront template and News Show Pro GK5 module updated for bug fixes. 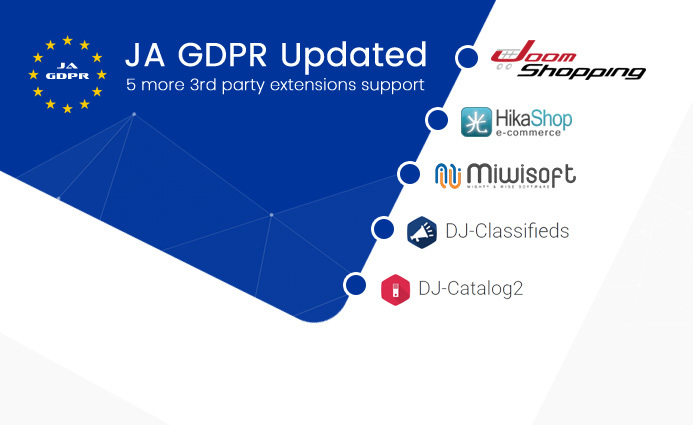 4. iJoomla: Guru 5.1.5 updated for bug fixes. 2. iJoomla: iSEO Joomla extension updated for bug fixes..